Our friend Mr Nooman is highly critical of Carillion’s practices with regard to those it employs at Swindon Hospital. If the allegations of blacklisting and bullying against Carillion are true he is quite right to stand up for the workers who have been affected. Nooman’s blog is keen on China. So I wonder what he’d make of this story, about an Oregon woman who found a letter describing conditions in a Chinese labour camp tucked away in her box of Halloween decorations? Although one cannot be sure whether it is authentic, the horrendous conditions it describes are consistent with the testimony of former prisoners. “Dai Liguo, formerly Detained Falun Gong Practitioner told the channel: ‘I was sent to Masanjia in 1999 and persecuted there. They produce handmade crafts for export. Still – their soldiers are super. There can be no doubt who wins Person Of The Year as far as I’m concerned: Malala Yousafza , anti-fascist heroine whose courageous stand for human rights against the Pakistani Taliban (TTP) nearly cost her her life. There are those who are trying to inject complexity into the debate and some of them unwittingly are becoming apologists for this mindset of murder and blowing up girls’ schools. Yet, there remains very little room for complexity. It can either be Malala’s Pakistan or TTP’s Pakistan, it cannot be both. This should not be a choice. A Pakistan without Malala and her other fellow girls fighting for education will not be worth living in. I know binaries are supposed to be lazy and not nuanced enough, however, a 14-year-old child is shot in the head for “promoting secularism”. There is no provision for nuance. One has to set one’s face against this and summon all resources to fight. The debate on drone attacks can and should continue. However it has no bearing on our responsibility to fight these medievalists. They should be fought and eliminated — not negotiated with or mollycoddled. Firstly, negotiation is not possible. Secondly, and more importantly, negotiation with them is immoral. An attack on our children is as direct and frontal as an assault can be. This is not a question of politics; it has become a question of survival. The fight should begin by naming the enemy loud and clear, i.e., the TTP and their ideology of hate. It is of some consolation to see the army chief condemning the assassination attempt on Malala. However, mere condemnation is not enough. The Pakistan Army has to stop the policy of considering the terrorist, any faction or network as “strategic assets”. The mindset has to be fought and fought as a whole and conclusively. It is now a choice between our children and these “strategic assets”. The Pakistan Army has, the over the past three decades, contributed to this ideology of jihad. For this reason, it also has the additional responsibility of erasing this misdeed and fighting these monsters. George Orwell, writing about a young soldier of the Spanish War, wrote: “But the thing I saw in your face, No Power can disinherit; No Bomb that ever burst; Shatters the Crystal Spirit.” To understand Orwell’s words, have a look at the face of that child and the sparkle and resolve in her eyes. We are not Malala, but we should be, we can try. Let us hope Malala lives long enough to see her Pakistan. So, thanks to the 30- year rule we now know that following the Argentine invasion of 1982 the US administration wanted Thatcher to agree a diplomatic solution to the Falklands dispute, and that she was, reluctantly, willing to agree to it. What these new “revelations” tell us for the first time, is how willing the Thatcher government was to consider various US peace plans and to countenance the possibility of giving up British sovereignty over the islands. This was in spite of major tensions between the UK and US that put the so-called “special relationship” under serious strain. All of which just goes to confirm the bankruptcy of those (at the time and since) who sought to portray this conflict as some kind of “anti imperialist” struggle by the Galtieri regime against a last outpost of British colonialism and/or Anglo-American imperialism. I was involved in a bitter (but very instructive) faction fight within what was called the Workers Socialist League, over the issue at the time and for a couple of years later. It convinced me that most people in the West who rant and rave about “imperialism” haven’t the slightest notion of what the word means in the Marxist tradition and, in fact simply want an excuse to support a less powerful capitalist class against their own, more powerful capitalist class. It’s called ‘dependency theory’, as developed by bourgeois economists in the 1960s to explain Latin American subordination to US capital and then adopted by a certain type of radical nationalist in Latin America and elsewhere to justify alliances with their own ruling classes . I was pretty sure that my comrades and I were right at the time. These “revelations” simply confirm it once and for all. These days, everything’s got science; or cellophane; or it’s frozen, ready to be popped into your old oven; or it’s safe for the kiddies and grandma too — the story is too familiar to all of us to tolerate much reiteration, but Jim, they never have been able to isolate SOUL long enough to deep-freeze it for storage and shipment. In fact, sometimes it seems like they forgot what it was, is and must be to the human heart and mind in our tin-soldier and popgun world. These men on this record know about that and some more besides and you can belive that if you will. One of the saddening and, to my mind, tragic oversights of this evening’s “jazz” audience is their slavish, slatternly devotion to the immediate and the topical. The eternal seems to be too sticky a substance to mess with — it doesn’t wash off the hands very easy and so I guess people must really want to feel, for the first time, really clean, or sterile, or be in the swim, or hep or maybe even hip if they are some down kitties. Not me, thanks. There’s a lot of dirt, grime and sadness in life, perhaps more than many can cope with but it’s there, right under the edge of the carpet and behind the mirror, under your fingernails and betwixt your pearly teeth. And along with the sour you can have your sweet too, plenty of it, but that sugar doesn’t mean beans without you have some salt to let you know which is which. Admirably stated by Ferd “Jelly Roll” Morton in a letter to his sister, to wit; “you got to take the bitters with the sweet” ( Mr Jelly Lord by Alan Lomax, Grove Press and the best book on jazz ever written). So, three long cheers for sadness that is blue instead of yellow, men that can admit to some real joy and know the hearse is parked just ’round the corner and above all, those gents that can say it all in that huge 4/4 beat that makes even this tired old correspondent “glad all over”, Orphan Annie’s old truism. By the way, did they really grab Daddy Warbucks on back income tax? This all wouldn’t have been possible without Harry Edison and Fred Green, you know. They know as much about the kind of music that I feel as any men who ever lived. They have earned — with no catawauling about travel, working conditions, the plight of the “jazzman” in America today, and related rot — the respect and love of many musicians and listeners, especially those who were around to sop up that great Basie band in the early ’40s. They are, truly GIANTS: yesterday through, and inclusive of, tomorrow. Not an awful lot of that calibre here anymore mbut they’re enough. Ed Jones, Hank, Persip, Zoot and Cohn are of the same mind about this too, so if you all can’t agree in the world who is right, we’ll wait for you to catch up if you’ll hurry. What Do They Know About Jesus? What do you know about that? And how do you think it happened? I wasn’t present when the deal was cooked up, but knowing whom these theological bunk-shooters serve and from whom they gets their orders, I can visualize the proceedings and tell how it happened, in essence if not in precise detail. The top profit-hogs very probably had a meeting of their board of stategy down in Wall Street the other day and counted up the forces they had mobilized in the grand crusade to break up the unions and beat down the workers who are trying so desperately to make their wages catch up with the increasing cost of living. They checked off Congress, both the House and the Senate. They checked off the President and the courts. They checked off the daily newspapers, from one end of the country to the other, and found a 100 percent score on that front. Then they called the roll of radio commentators, and made a note to put pressure for the firing of the remaining two or three half-liberal “news analysts” on the air who are not going along 100 per cent. No sooner said than done — but good. Now comes the public statement signed by 637 clerical finks who state that the closed shop (they mean the union shop) violates freedom of conscience and the Eight Commandement, “Thou shalt not steal”. They appeal to Christ on the ground that the union shop violates “the individual’s responsibility to God” and obliges Christain men to be “yoked together with unbelievers”. This, they say is wrong and not according to Jesus. Well, I feel like saying to these strikebreaking sky-pilots what Carl Sandberg once said to an anti-labour evangelist 30 years ago: “Here you come tearing your shirt, yelling about Jesus. I want to know what in the hell you know about Jesus.” I don’t know too much myself, but if the only accounts of him we have are true, they called him “the Carpenter”; and he once took a whip and drove the money-lenders out of the temple. 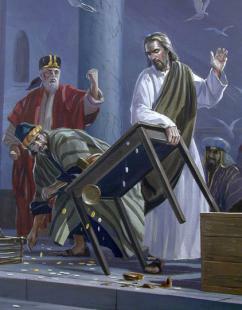 “Ye have made it a den of thieves”, he shouted, in white-hot anger. And what have you done, you 637 fake-pious pulpit pounders who serve the moneyed interests against the people? You have made it a den of theives and liars too. You have the gall to represent the lowly Nazerene as a scab-herder; and to tell the Christian workers, who revere Him as the friend and associate of the publicans and sinners, of all the poor and the lowly, that they should not be “yoked together with unbelievers” in a union to protect their common interests. That’s a lie and a defamation. You’re simply trying to serve the rich against the poor, to help the rich in their campaign to break up the unions, which are the only protection the poor people have. And don’t try to fool anybody with the statement that you are in favor of unions “properly conducted” — under open-shop conditions. We know what you mean by this mealy-mouthed formulation. Such unions, as Mr. Dooley once said, are unions which have no strikes, no dues and very few members. And leave Jesus out of your lying propaganda, you scribes and pharisees, full of hypocrisy and iniquity. Every time you mention His name you libel Him, regardless of whether the story of His life and death be taken as literal truth or legend. The Carpenter of Nazareth has been badly misrepresented in many ways for many years, but your attempt to pass Him off as a union-buster goes just a little bit too far. It is just about the dirtiest trick that has ever been played on Jesus Christ since the crucifiction. *Republished in ‘Notebook Of An Agitator’, Pathfinder Press, 1958 and 1973. Bring in the birth, of hope and love and light. Click on that link (above: “best jazz”) to the Boswell Sisters’ highly-sophisticated yet bluesy version of ‘There’ll Be Some Changes Made’ and as well as hearing some fabulous, ‘modern’ close-harmony singing, you’ll see a secret that the carefully-posed official publicity photos of the time (as with FDR) kept hidden: Connee was wheelchair-bound. P.S: A fascinating recent interview with Vet Boswell’s grandaughter over at Michael Steinman’s great ‘Jazz Lives’ blog, here and a new blog devoted to ‘the Bozzies’ that you should visit.